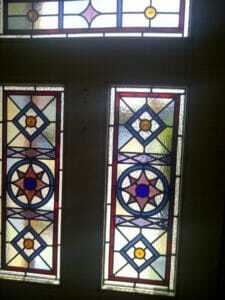 Many thanks, Coriander Stained Glass. 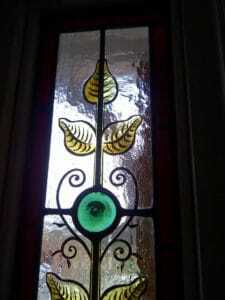 Coriander Stained Glass News 04/01/14 – January Sale! 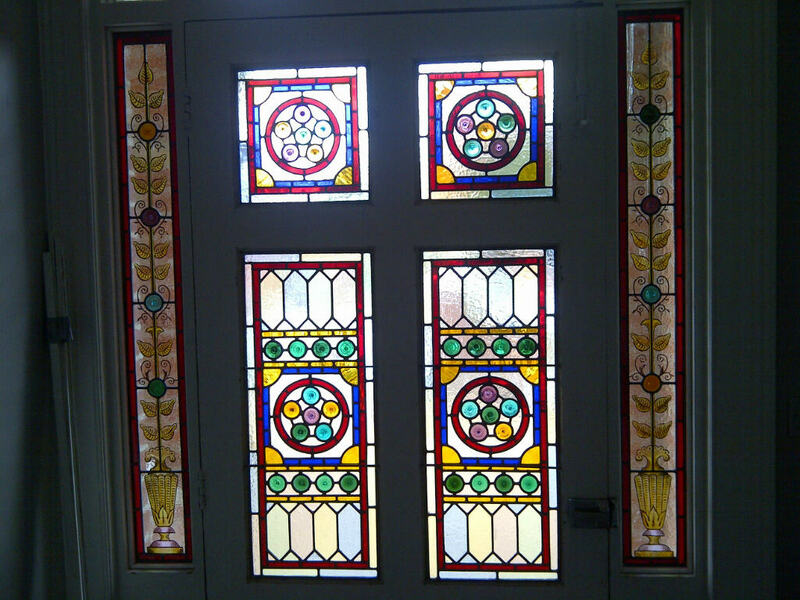 The team at Coriander Stained Glass are delighted to announce that we are offering a 10% Discount off all orders for stained glass in January 2014. 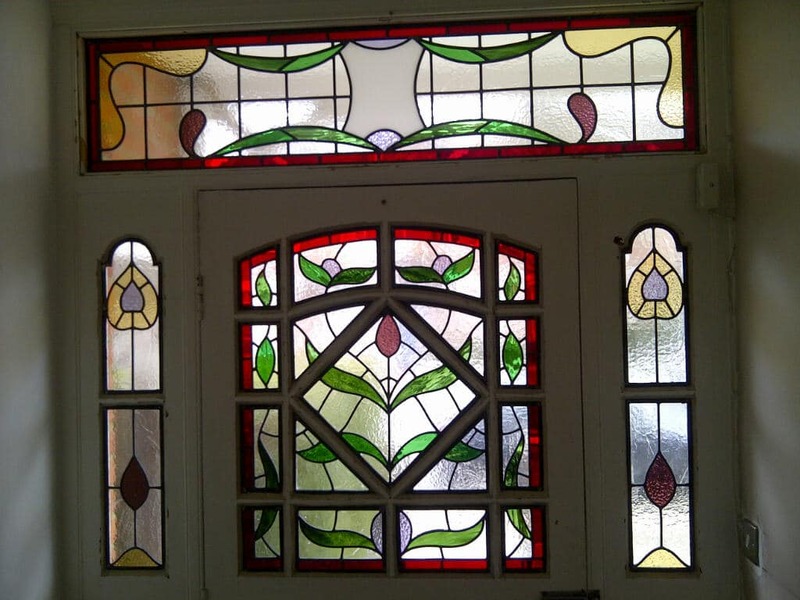 Our work covers every period and style from Victorian to Art Deco and hand painted designs, so no matter the period of your property or the style you would like to achieve, we can help to beautify your home with stained glass of any style. 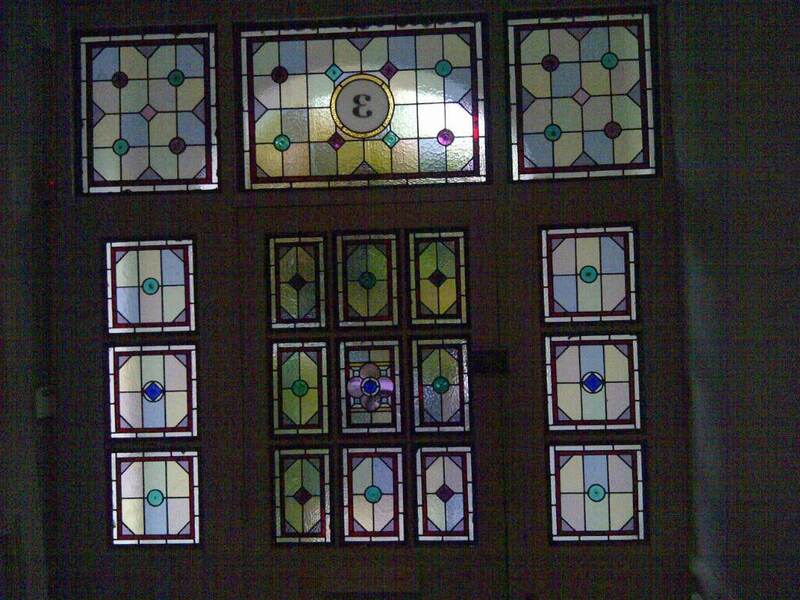 Please have a look at our portfolio to see hundreds of different examples of our previous work. 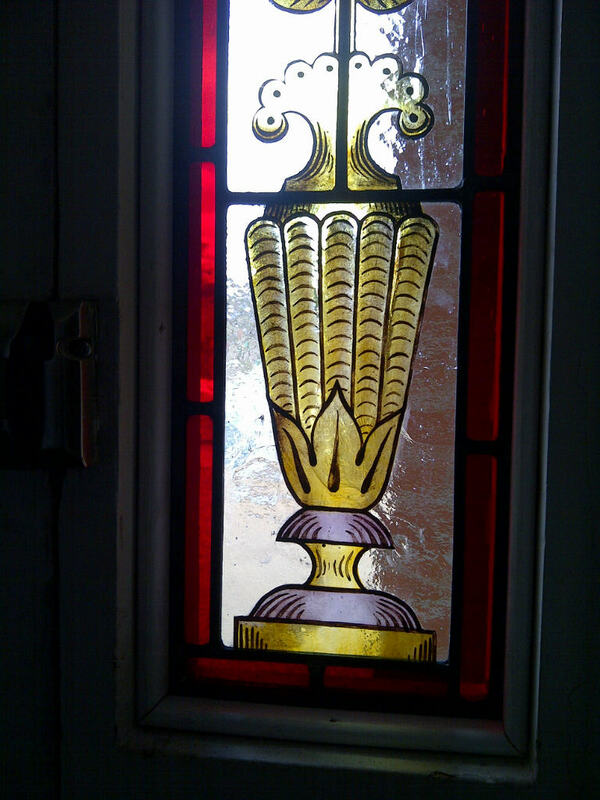 Happy new year from Coriander Stained Glass. 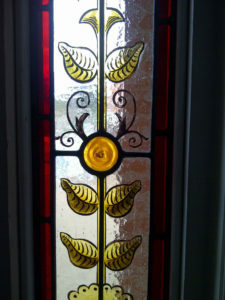 Seasons greetings from all the team at Coriander Stained Glass. 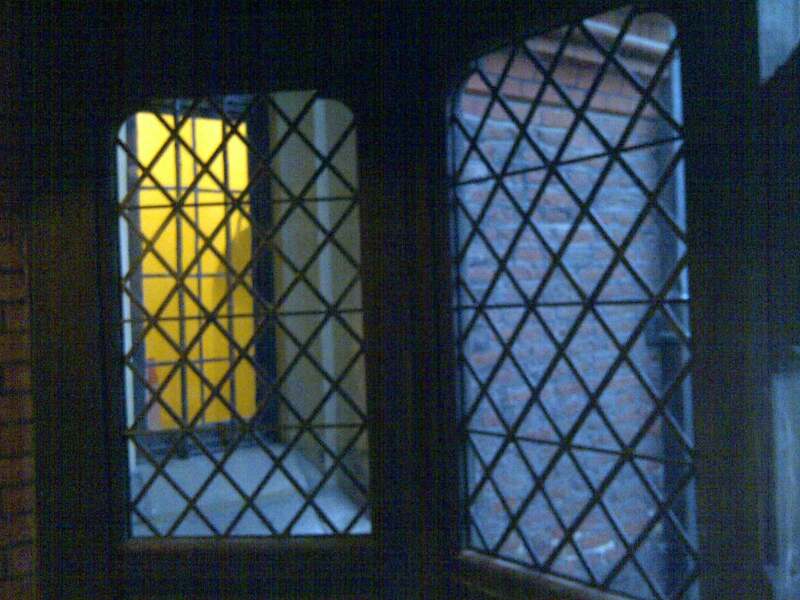 Today we would like to show you two diamond panels restored in the Master Carpenters Court, Hampton Court Palace. 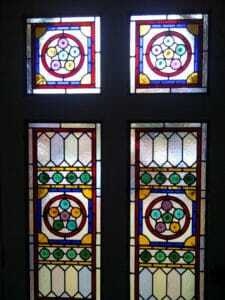 We have also recently designed 3 new Victorian Stained Glass panels. 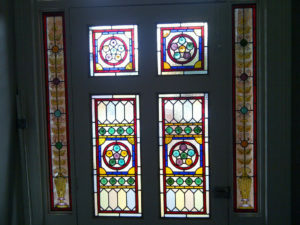 Please do head over to our Stained Glass Portfolio pages where you can see hundreds of examples of our previous work. 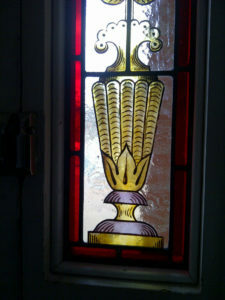 Seasons Greetings to all from Coriander Stained Glass. 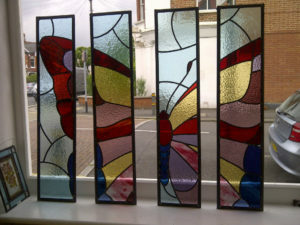 At Coriander Stained Glass we have been working on some great Stained Glass projects recently. 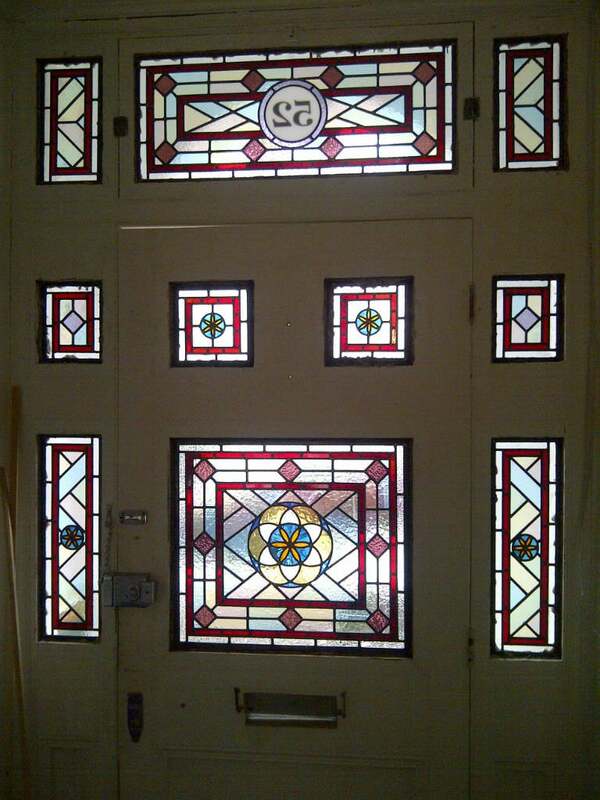 Here are some of our recent Victorian Geometric designs. 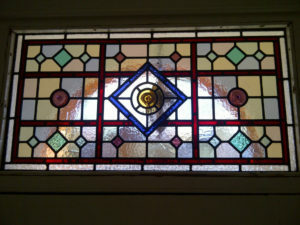 Check back soon for more of our stained glass projects covering all different styles are eras. 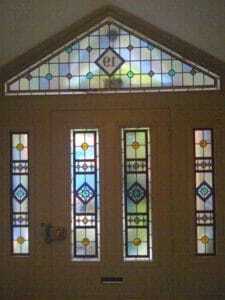 To see our full portfolio of stained glass work, please visit our gallery. 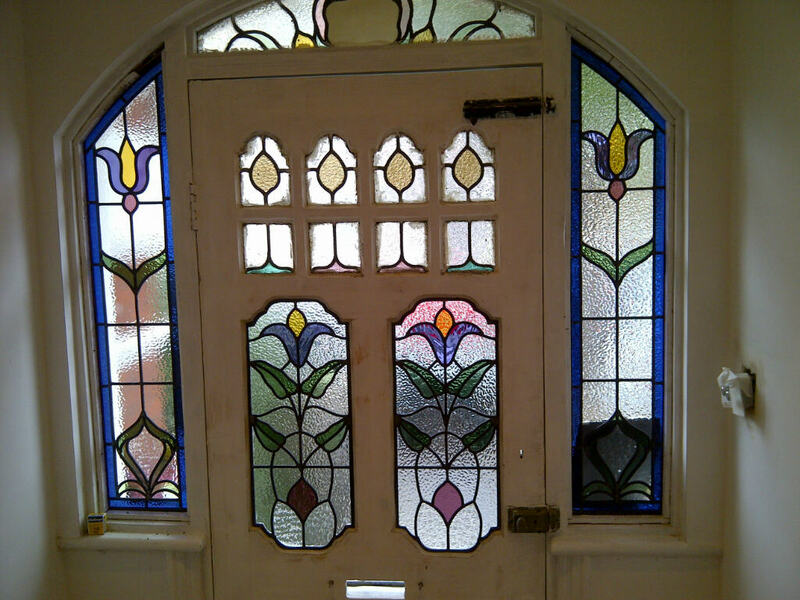 This week at Coriander Stained Glass we have been busy restoring two Edwardian front entrances in Wimbledon Park to their former glory. 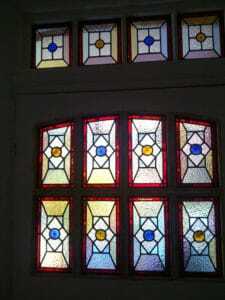 The stained glass has been replaced, replicating the original designs and glass that would have been used when the houses were built. 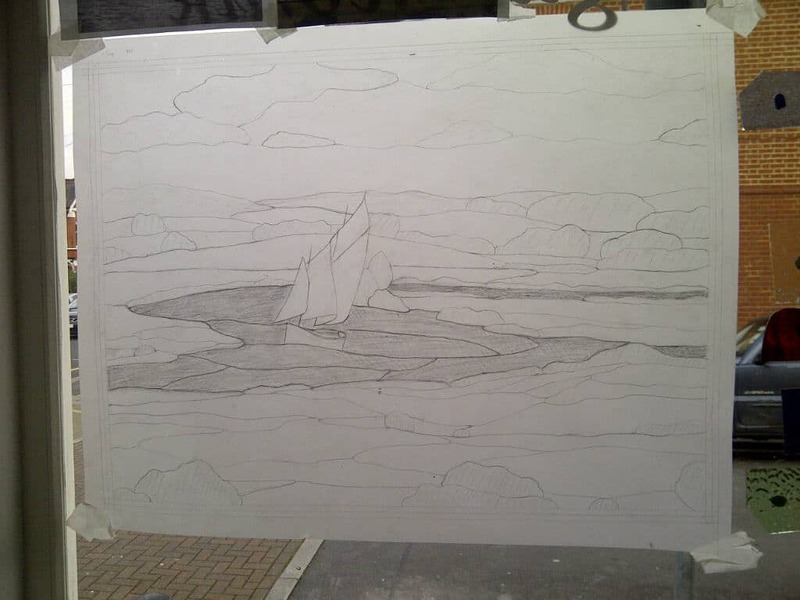 Also this week we have been working on a design template for a beautiful picture window representing a view in Brittany. 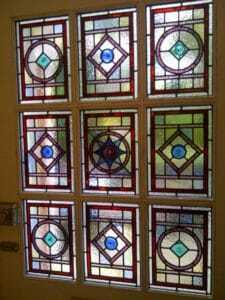 Thank you for visiting, and don’t forget to check out our regularly updated Stained Glass Portfolio for more examples of our work. 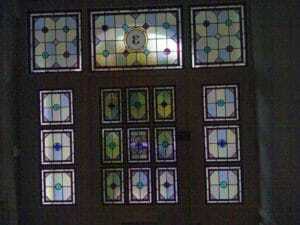 Coriander Stained Glass has made this main door panel, 2 long sidelights and central toplight to marry with the other orginal panels in this front entrance in East Twwickenham. 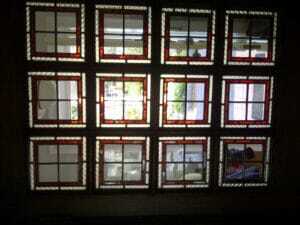 Check back soon for more of our recent glass work. 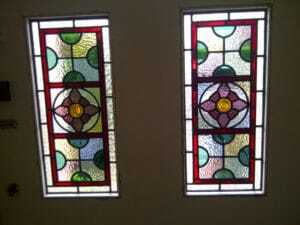 Please visit our Stained Glass Gallery pages for more of our work. 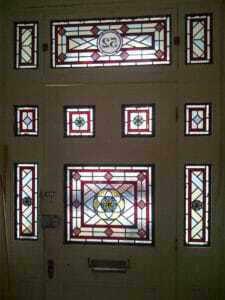 Good evening from all of us here at Coriander Stained Glass. 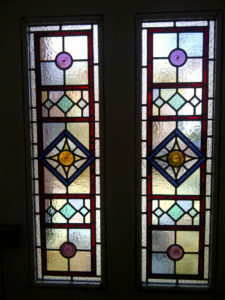 The summer is finally well under way and we hope you have all been enjoying the good weather with family and friends. 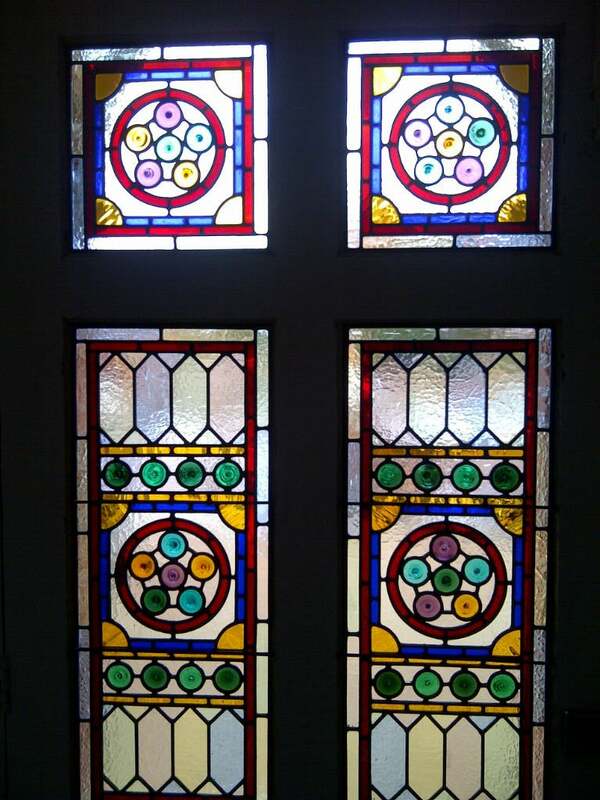 We have a couple of really special projects to share with you today; two Victorian and one bespoke piece of stained glass. This first piece shows a stained glass for a set of internal partition doors. 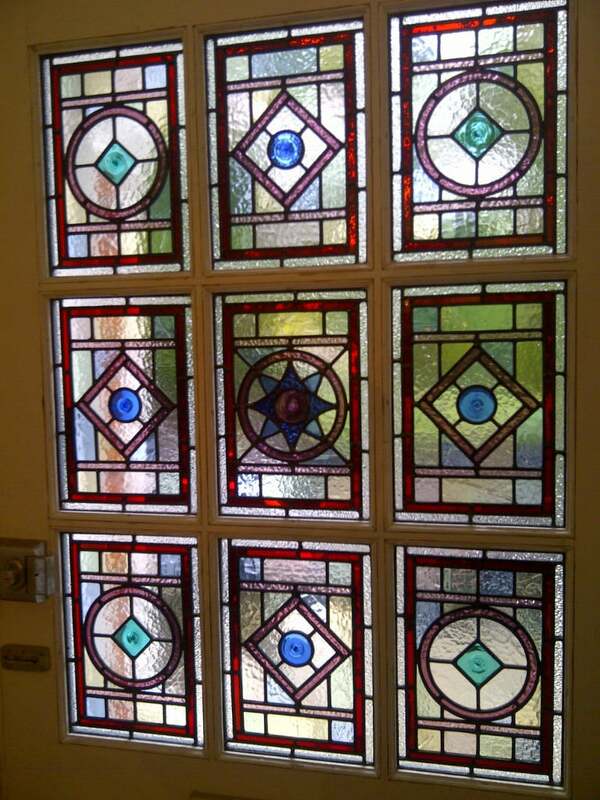 It is the choice of texture and colour that make this piece come to life, with each choice of texture complimenting the piece next to it. 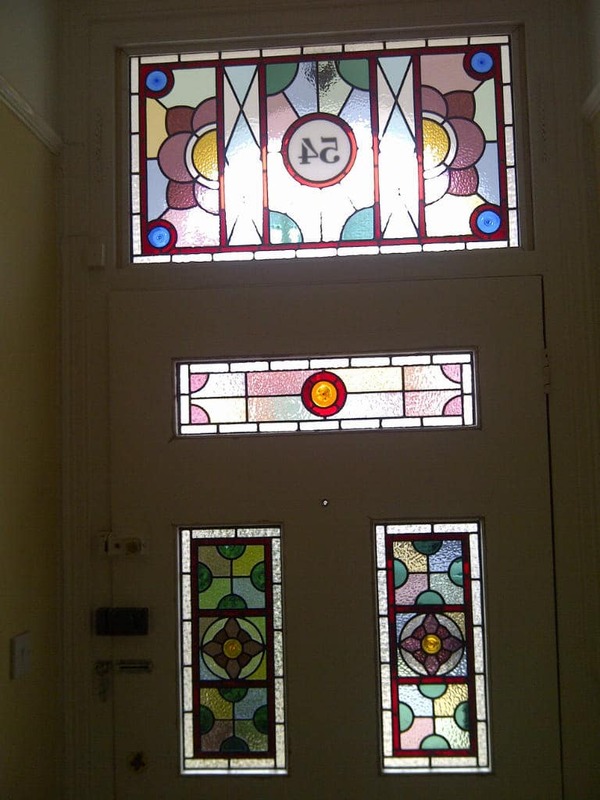 Internal feature doors such as this make a stunning focal point for your home and allow light to travel from one room to another, which can really open up and brighten your internal space. 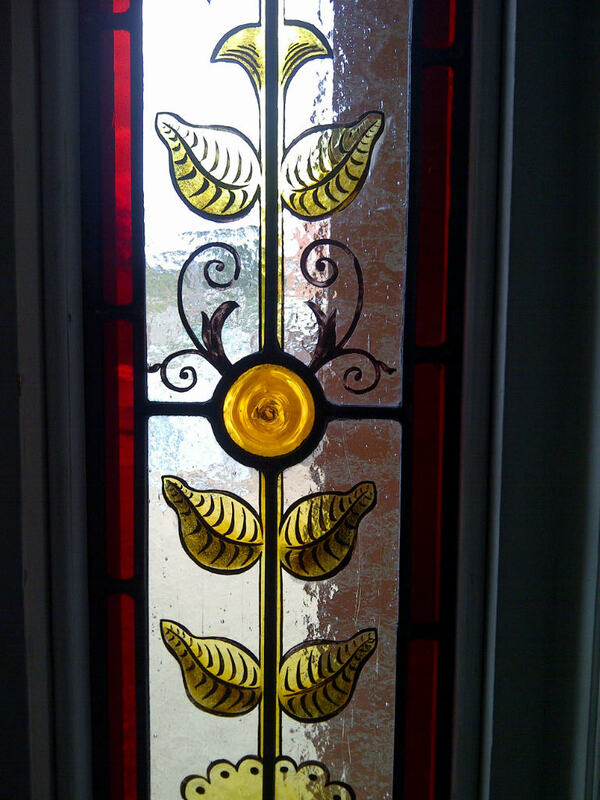 By choosing clear, textured glass for the background not only does the focal point of the butterfly carry more impact, but the whole piece allows the maximum amount of light to pass through. 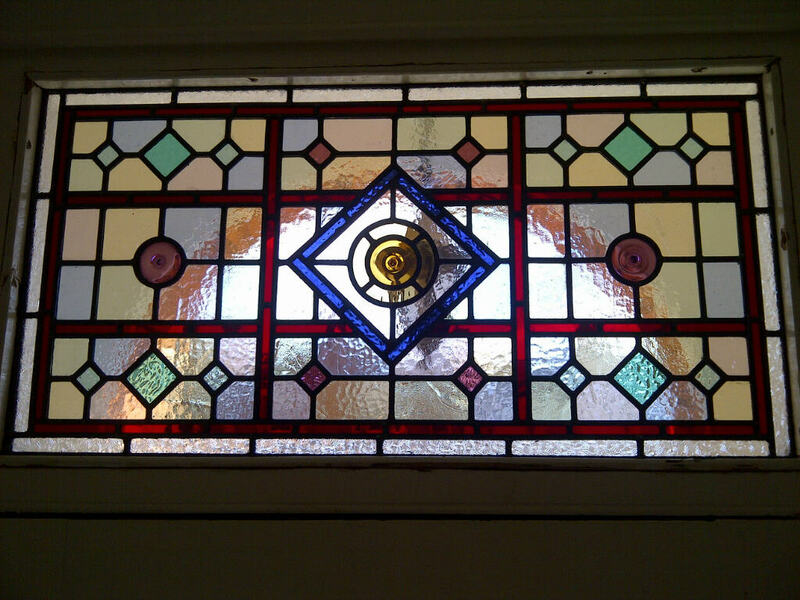 This first design of Victorian stained glass is specific to a small area of Wimbledon Park. 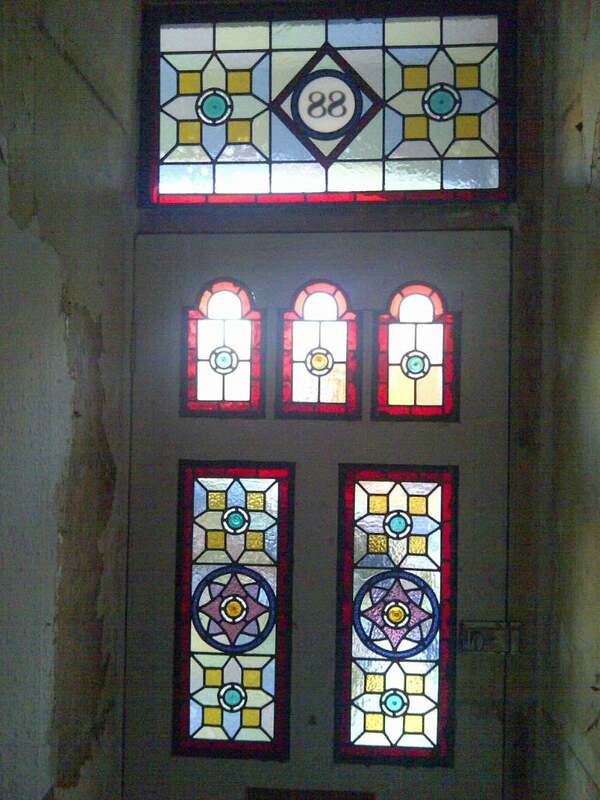 Here we have removed all three panels because the lead structures had worn out and were weak and bowing. 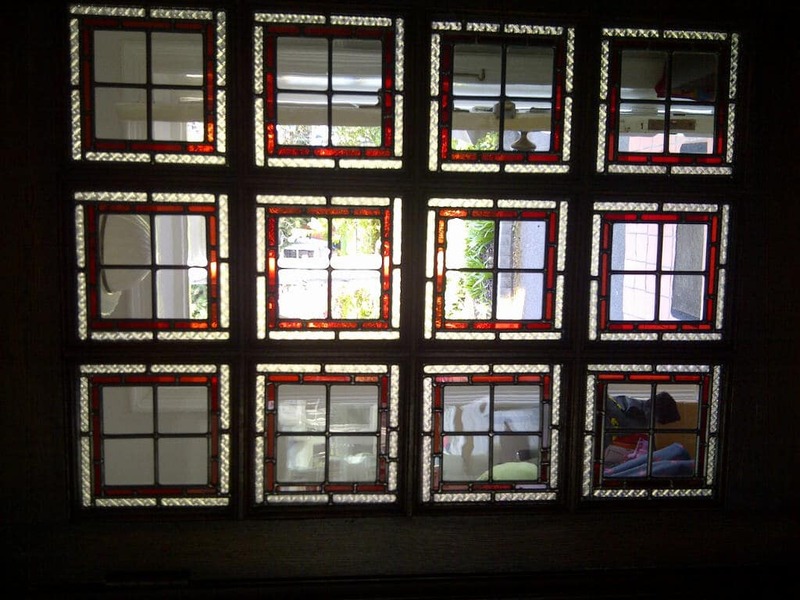 At our Wimbledon workshop we stripped the panels of lead and rebuilt them. Three of the rose paintings were missing or broken so we have replaced them – Margaret, our in house artist, hand painted them at our Wimbledon shop. 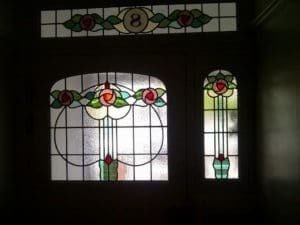 These next photos show a beautiful set of newly created Victorian geometric stained glass, the design copying the original for the road when the house was built. 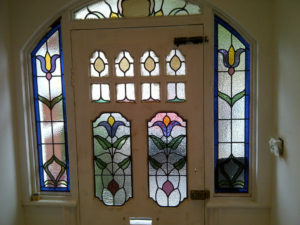 The colours of the top light tie in with the two vertical panels in the main door, and typical features of the era can easily be identified. 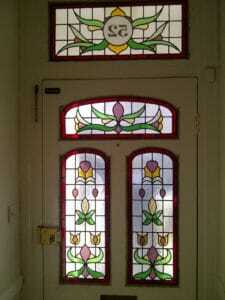 With the pastel geometric background and ruby red border,this piece is undeniably Victorian. 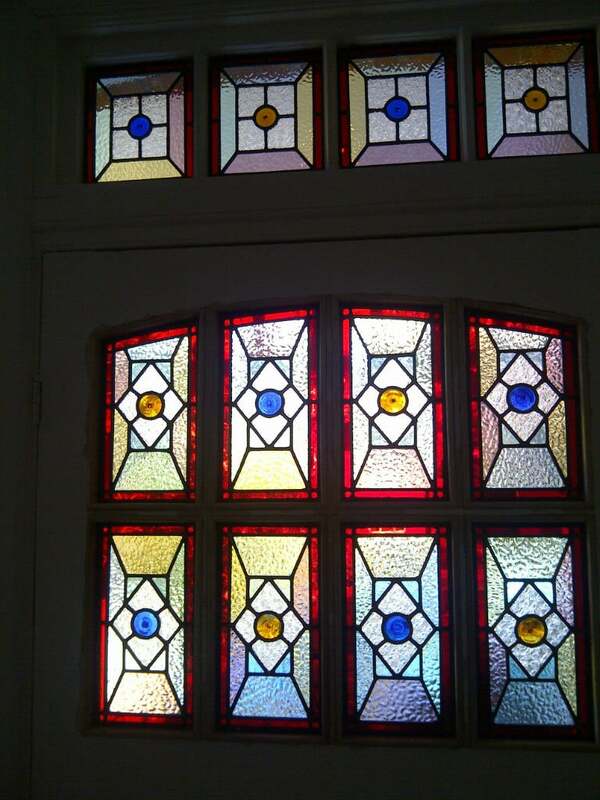 That’s it for today but check back later this week, we have many more beautiful projects to share with you. 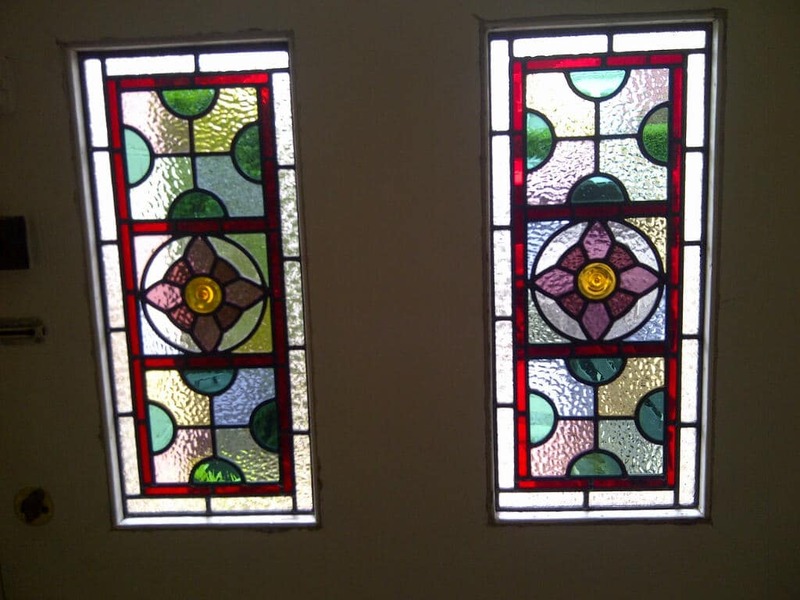 If you are thinking of a stained glass window for your own home, take a look at our stained glass portfolio for more ideas and inpsiration. 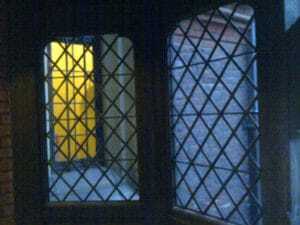 You can also follow us on Facebook and Twitter. 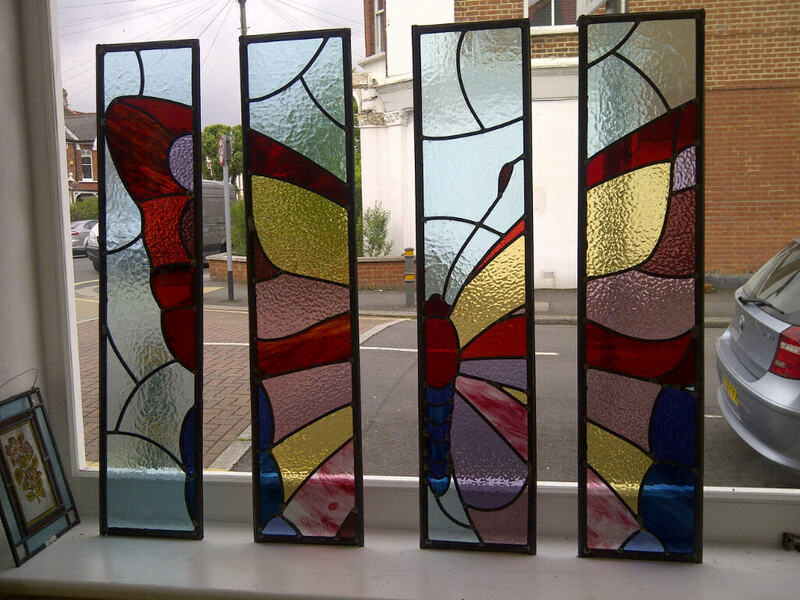 Here at Coriander Stained Glass we’ve been keeping busy with a number of projects, a few of which we are going to share with you today. 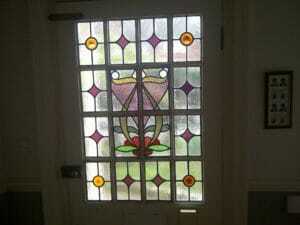 This is an internal door in a beautiful Edwardian home in Long Ditton, Surrey . 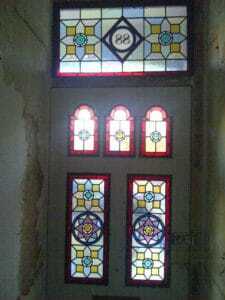 The original lead structure over the decades had weakened and there is only one way of resolving this. 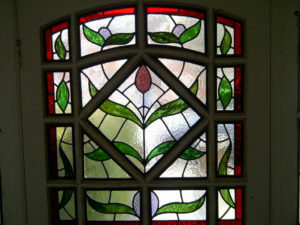 The lead light must be taken apart and the lead structure replaced, which is what we did with all twelve of these panels. 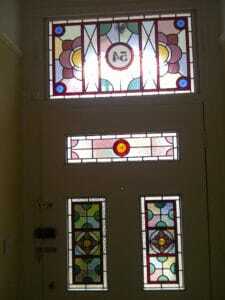 This process also cleans the glass very effectively so that it shines and glistens. 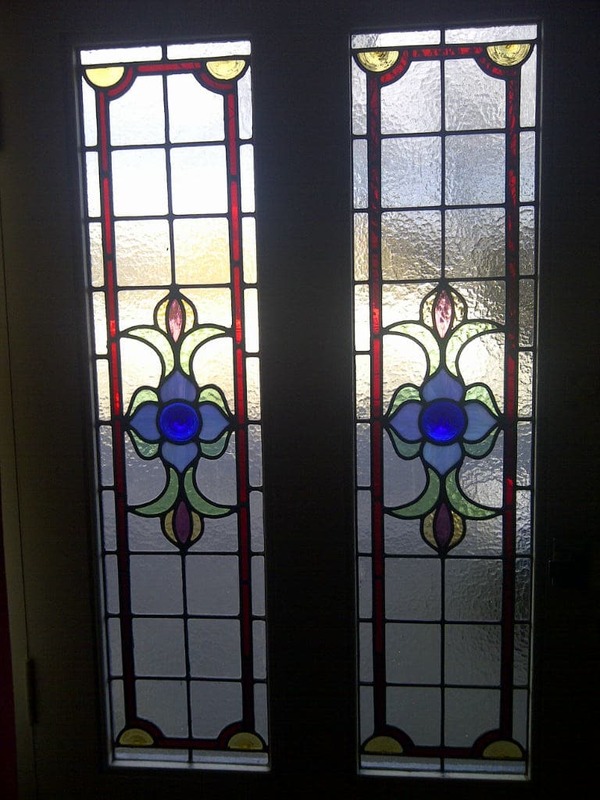 This piece works particularly well for an internal door because of its’ placement within the home, you can see in the photograph that it is in a place that allows natural light to pass through it and creates a wonderful transition between rooms. 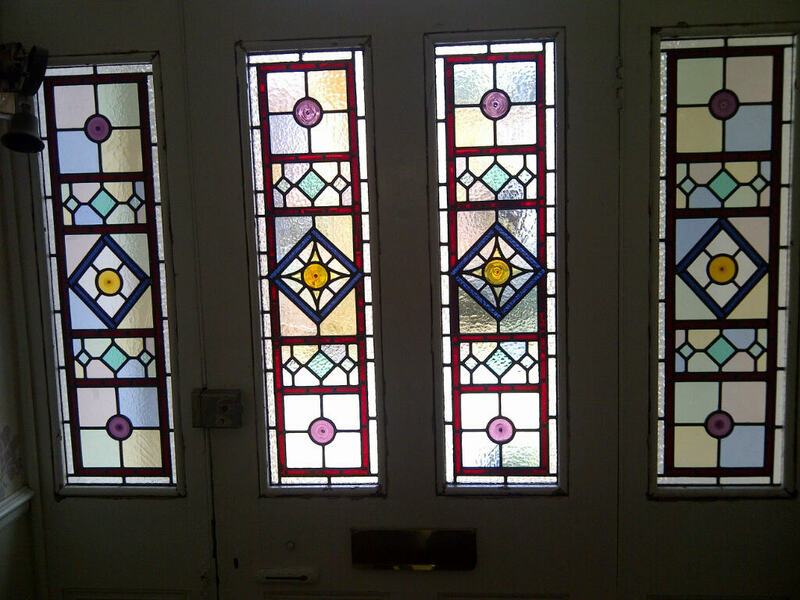 This next set of pictures shows a beautiful set of Victorian geometric stained glass we have recently fitted in a home in Wimbledon, South West London. Features typical of the era include the ruby red border, the geometric shapes, and the pastel shades used for the background glass. 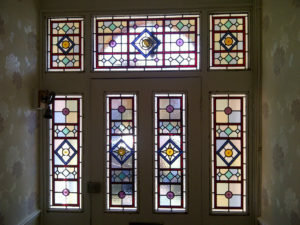 Stained glass completely transforms the entrance of a home, creating an impressive, decorative main character feature and opens up what is otherwise usually a quite dull space. 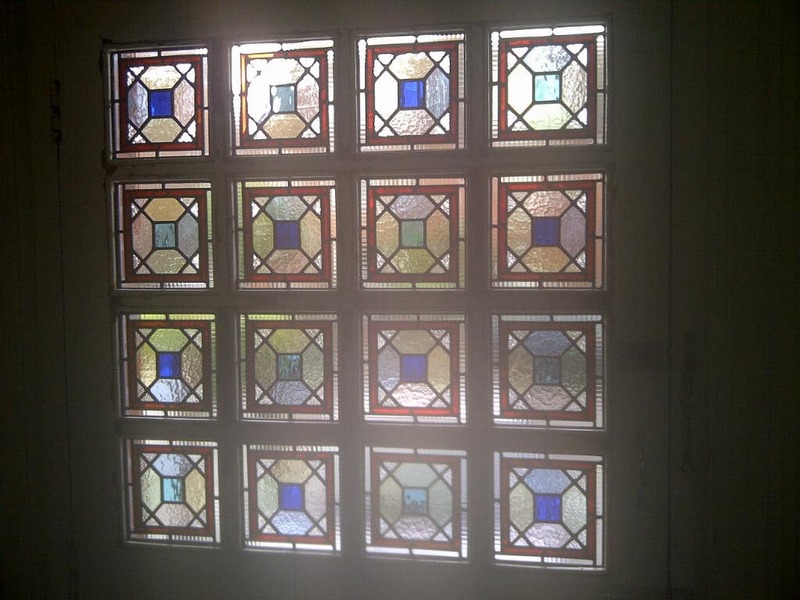 If you’re looking for inspiration for a piece of stained glass for your own home, there are lots of beautiful examples to be found in our stained glass portfolio. 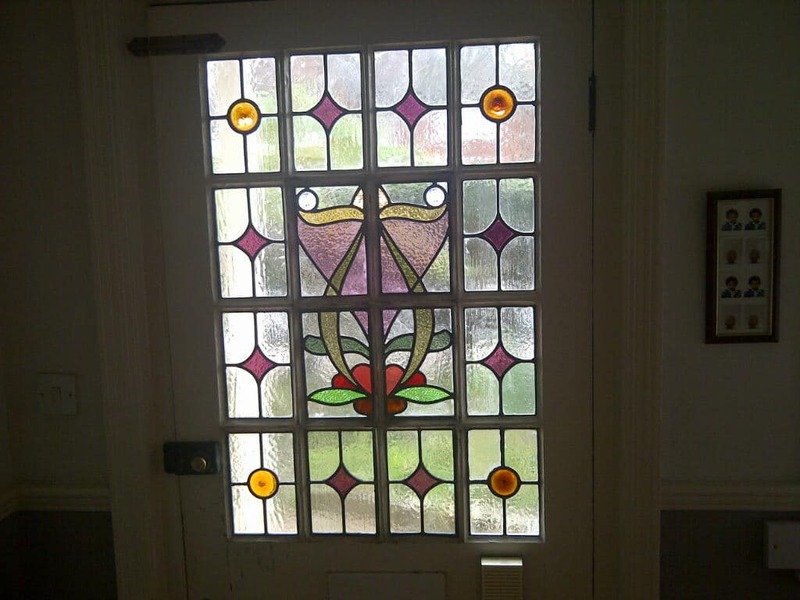 You can opt for a design that is traditional and in keeping with the properties in your area, or we can design you something completely bespoke from a drawing or your favourite picture. 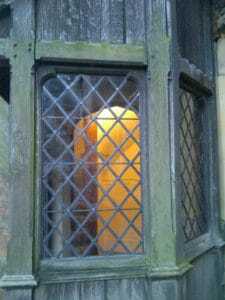 Don’t forget you can also keep up to date with all our latest news on Facebook and Twitter. 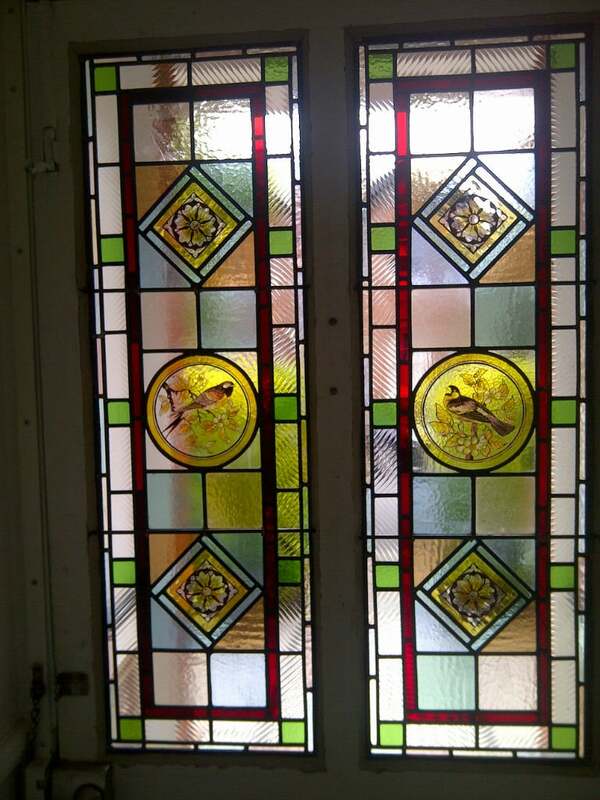 From all of us here at Coriander Stained Glass we hope you’ve been enjoying the warmer weather and like us, we’re sure you’re hoping it’s here to stay! 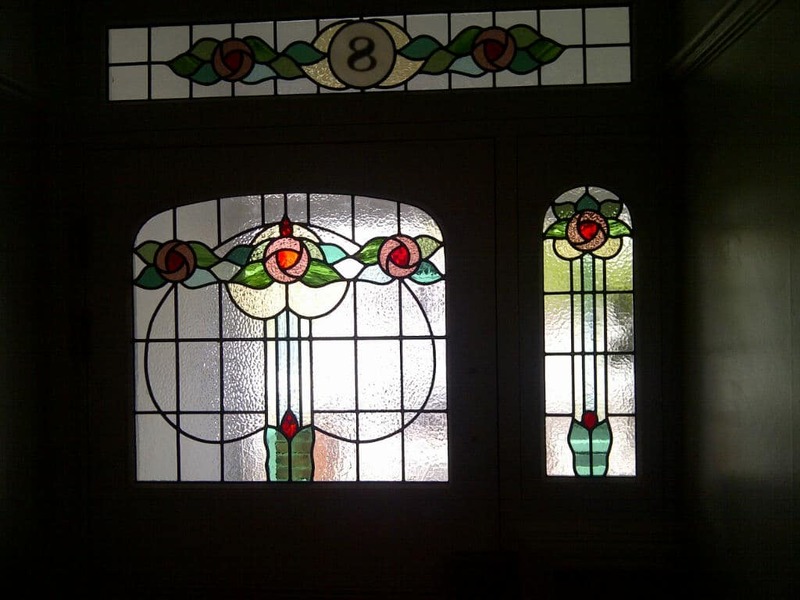 Today we’d like to share with you some of our latest Edwardian projects, with a little insight in to the era and its’ defining features. 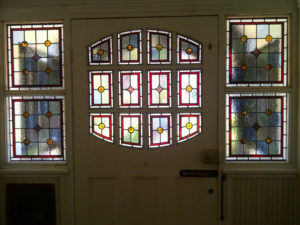 This first project was for an Edwardian home in South London. The stained glass has been hand made piece by piece in our workshop, copying the original design found in the area. 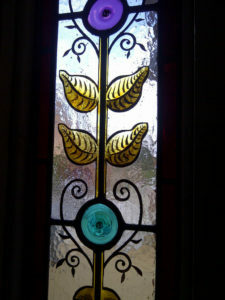 Here you can see typical features of the period, such as the clear, textured glass in for the background and the flowing leaf design which is in a coloured, textured glass. 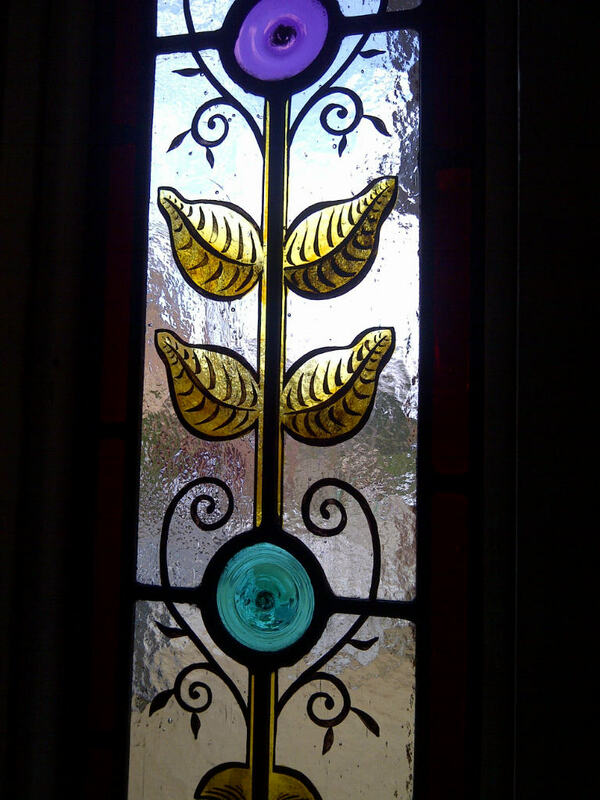 Getting the correct combination of textures is key for Edwardian Stained Glass and in this piece it ties the different areas of the design together beautifully. This next Edwardian piece features a lovely bold focal point of the blue/lilac flowers, with the little hand painted gems adding a brighter pop of colour to the centre of the flowers. Again, texture plays a key part in this piece, with the contrast between the textured clear background and the smoother texture of the flower petals. 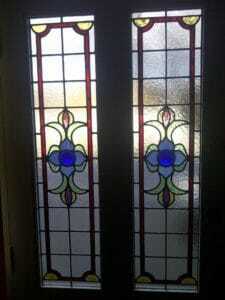 The next two pieces are more varied in colour. The first is a move away from the more commonly used ruby red border to this wonderful sea blue, with the tulip-like flowers on both the central and outer panels. 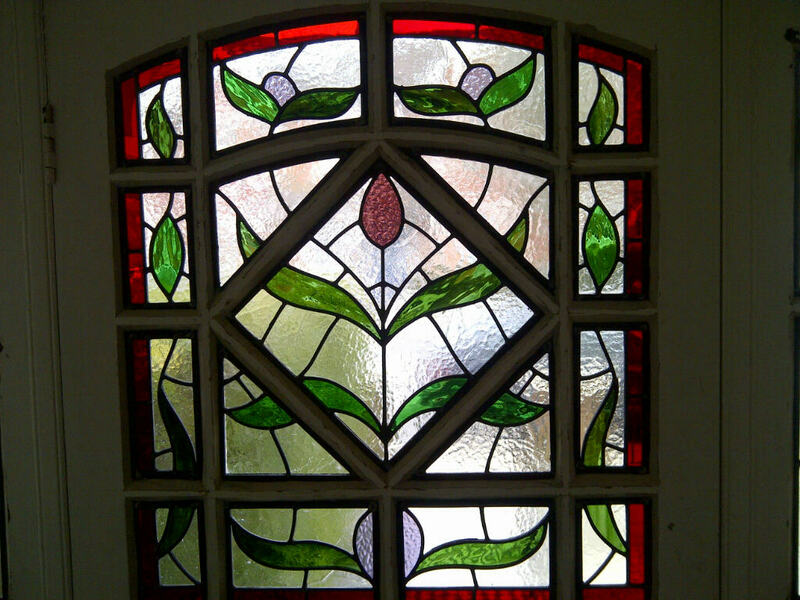 This second piece uses a fantastic combination of colour and detail, with the diamonds and gems creating a border around the floral focal point. 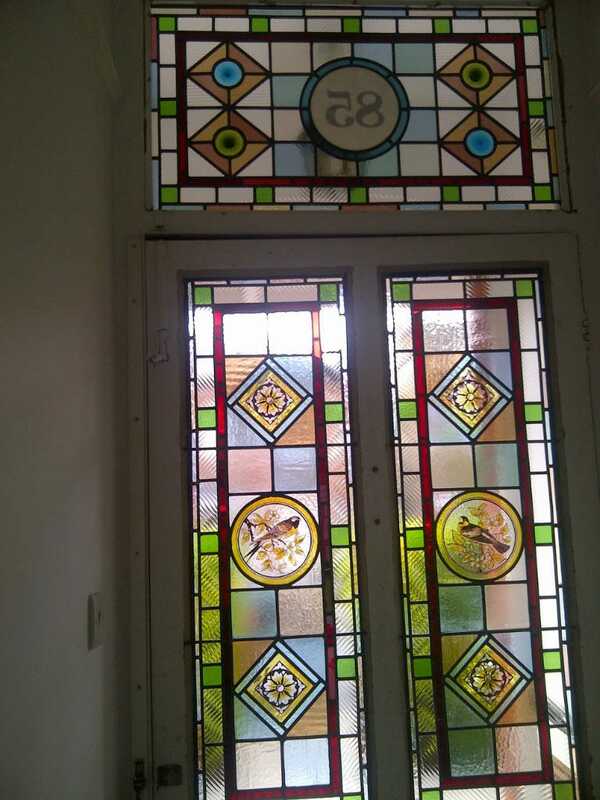 If you are thinking of a stained glass window for your own home we hope that we have given you some food for thought, as these are just a few examples of Edwardian Stained Glass, if you’d like to see more please take a look at our stained glass portfolio. 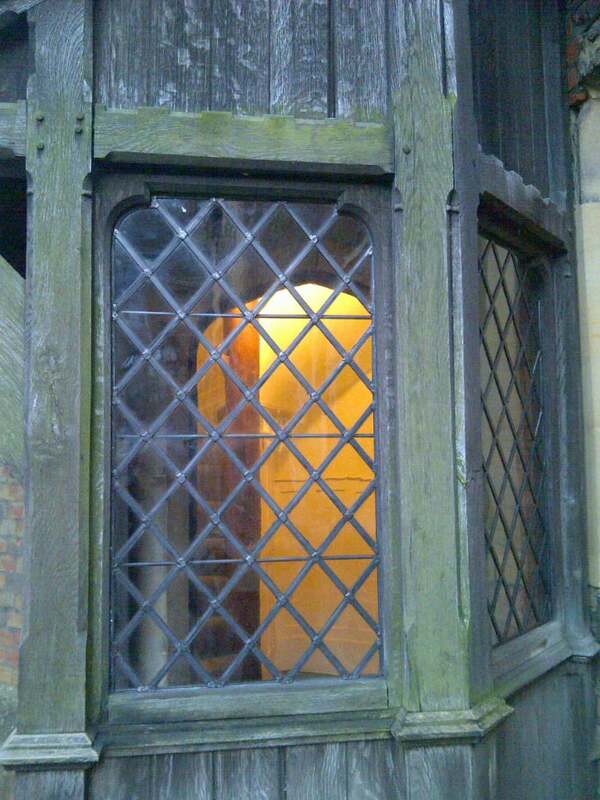 You can also keep up to date with our latest news by following us on Facebook or Twitter. 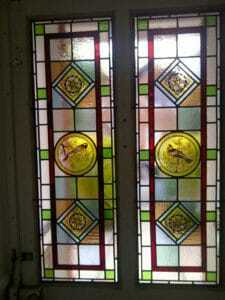 Check back later in the week when we’ll be sharing some of our Victorian Stained Glass pieces. 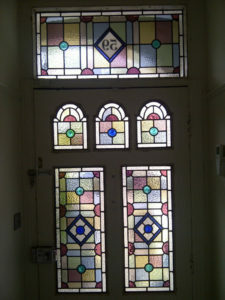 We can’t believe it’s June already here at Coriander Stained Glass, but we’ve been busy working hard on some new projects and we’d like to share some more with you today. 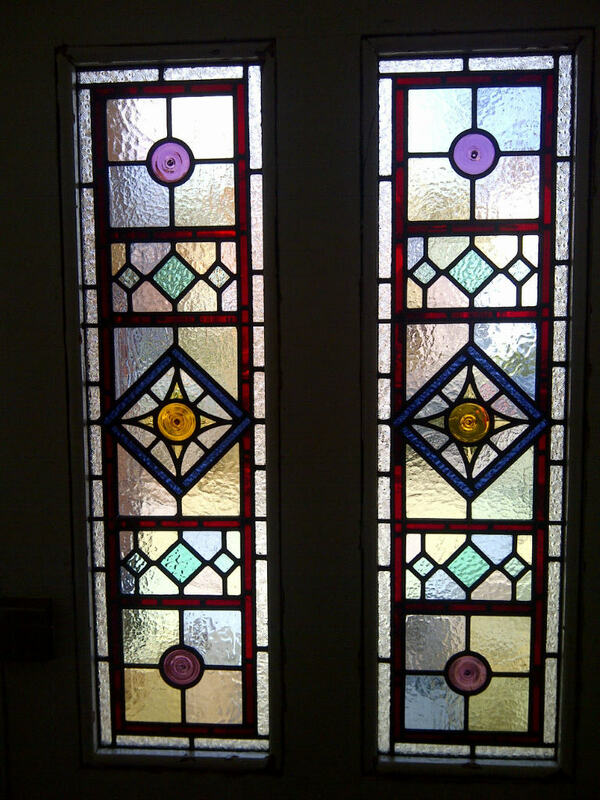 This beautiful set of stained glass leaded lights were recently made and fitted in a home in Ealing, London. 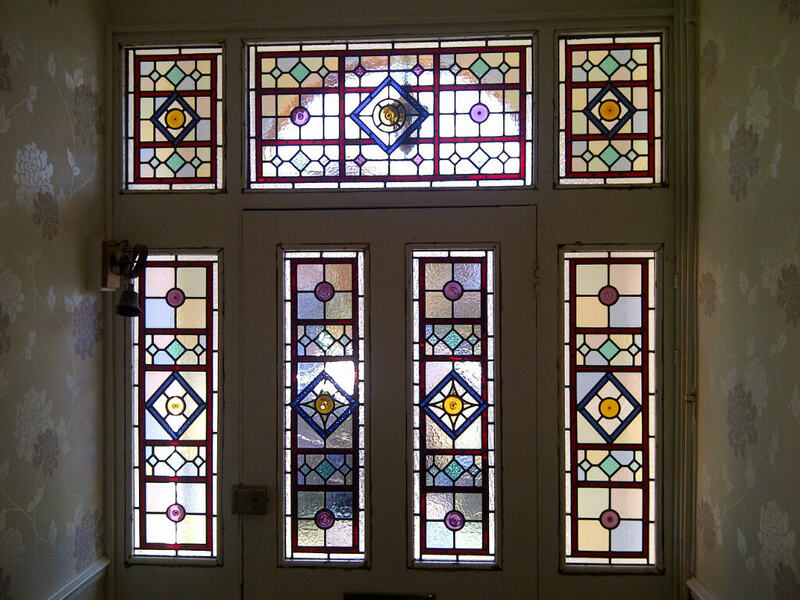 There are, however, traditional colour combinations used for different design types that we recommend throughout the process. 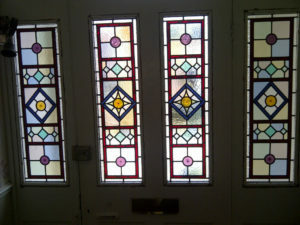 As you can see from these photographs the sidelights are in painted glass, the colours are completely traditional mute yellow, amber and brown/black with the traditional ruby red border. 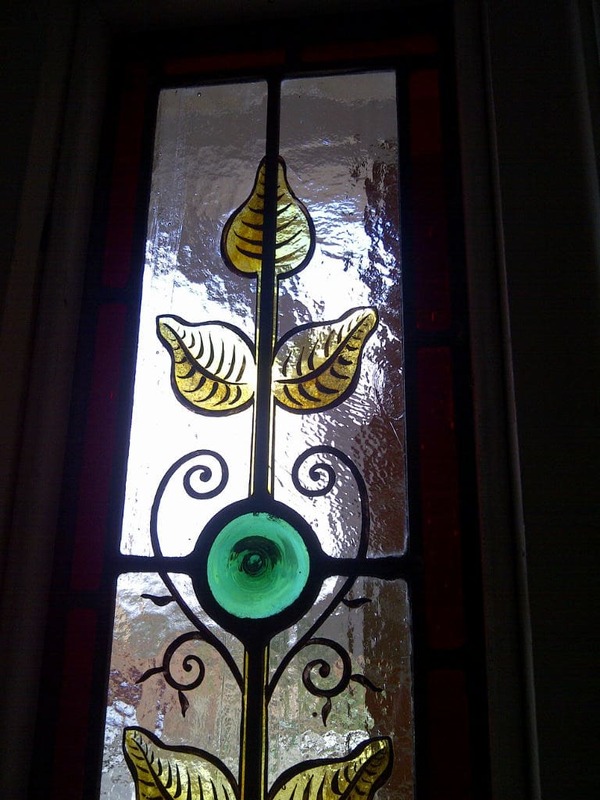 Our in house artist, Margaret, lovingly hand paints each piece of glass from either her own sketches or photographs produced by our clients. 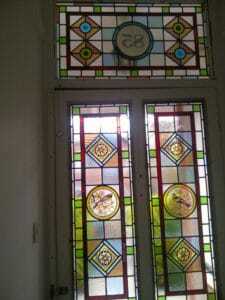 The painted columns in this piece really add a touch of elegance to what is otherwise a quite traditional Victorian piece. 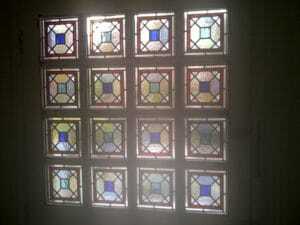 The 4 central windows also have the traditional border to bring the piece together, with the bold geometric pattern over a background of pastel shades. 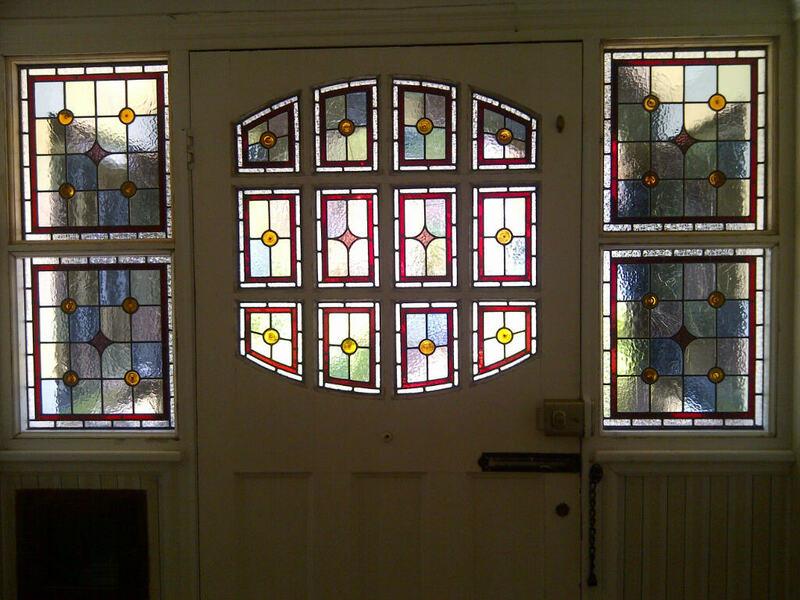 The little round gems are hand painted and can therefore be created to match perfectly with the other features in the window. 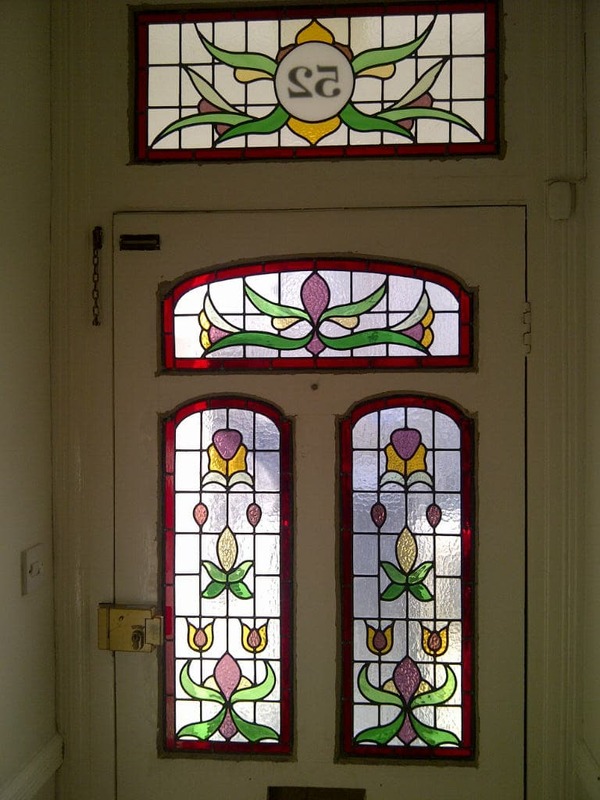 We have lots of beautiful examples in our stained glass portfolio if you are thinking of a stained glass window for your own home, with some stunning glass painted by Margaret in our hand painted glass designs gallery. Well that’s it from us for today, but we have plenty more projects to share with you in the coming weeks so be sure to check back soon or keep up to date via Facebook or Twitter.